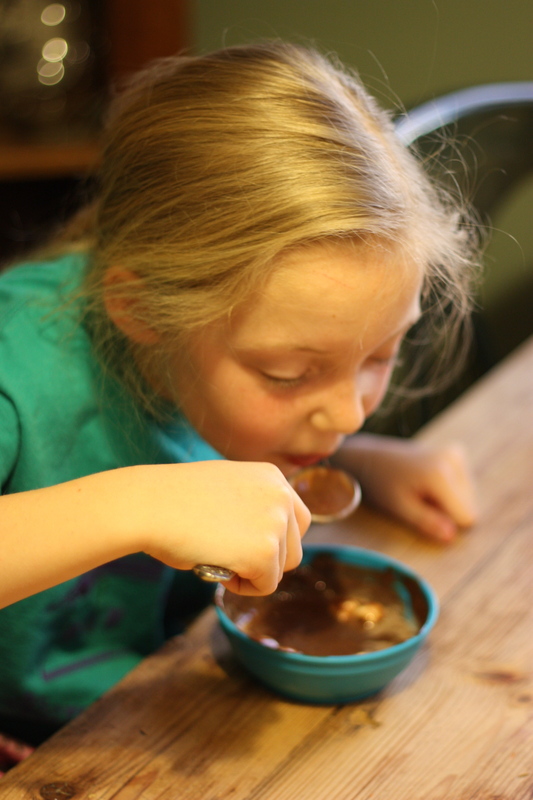 My 6-year-old Lucy asks for pudding just about every night after dinner. She typically wants tapioca, but Henry usually complains at this. Tonight, because I wanted to try this new recipe, we had chocolate, and oh my! what a pudding! After the first bite, I thought, “This recipe should definitely have the word ‘velvety’ in its name,” and then I looked back at the recipe to see that it did. So, perhaps that was subliminal, but regardless, this pudding is WONDERFUL. And simple. My two most favorite combinations. The recipe comes from Lucinda Scala Quinn’s Mad Hungry, a really fun cookbook by Martha’s head food editor. Quinn suggests using this as a basis for a chocolate pie (great idea). 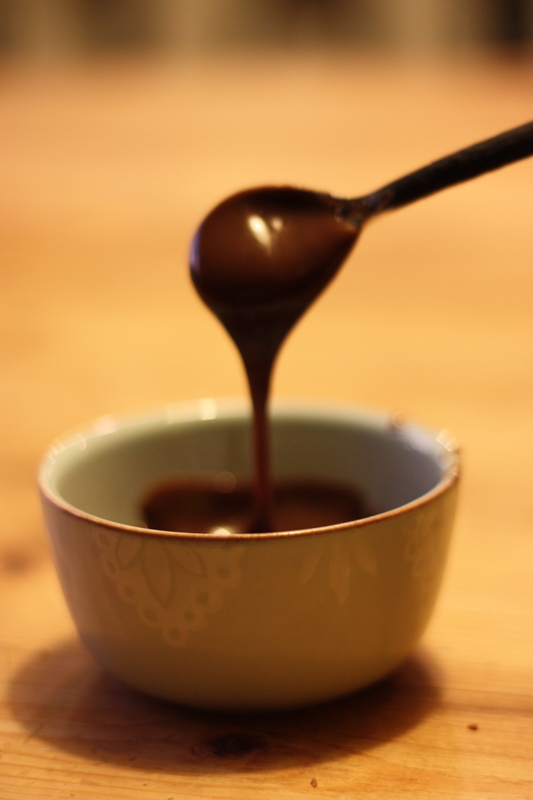 The high sugar content works well if you’re using a dark chocolate powder. If using something milkier, you may like less sugar. For my family of six, I doubled it, and had just a little leftover. My kids topped it with marshmallows. It looked perfect. Henry was helping me with this awesome texture shot. In a medium bowl, whisk together the flour, cocoa powder, sugar, and salt. Press through a sieve into a medium saucepan to eliminate any lumps [I didn’t do this, and had no problem]. Whisk in the milk. Over medium heat, stir the mixture until thickened, about 2 1/2 minutes. Be sure to get the spoon around the edges of the pan as the mixture thickens. Whisk if needed to combine well. Stir in the butter. 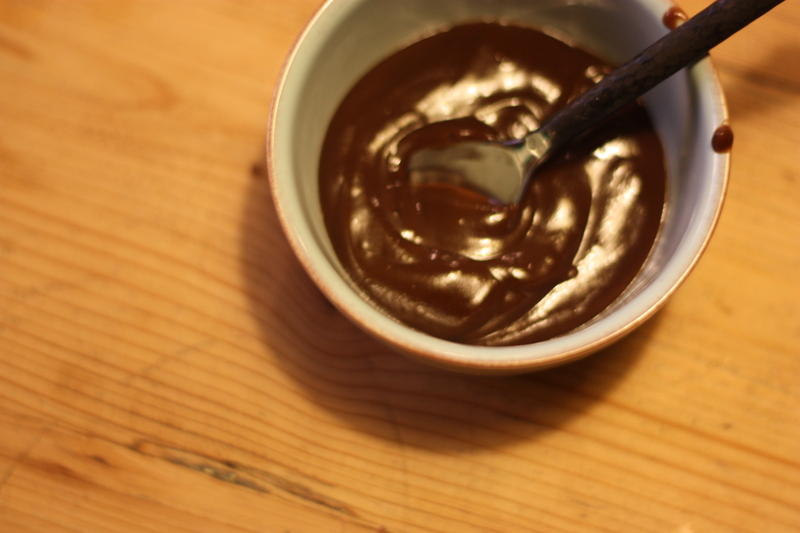 Whisk 1 tablespoon of the hot chocolate mixture into the beaten egg and return to the pudding in the pan. Stir in the vanilla and cook to completely thicken, 2 to 3 more minutes. Strain through a sieve and pour the pudding into four to six 6-ounce pudding cups. Serve warm, or cool first and chill until serving. Press plastic wrap directly on the surface of the pudding to prevent it from forming a skin (unless you like it!). Top with a dollop of whipped cream, if desired. Lucy gets pudding for dessert.